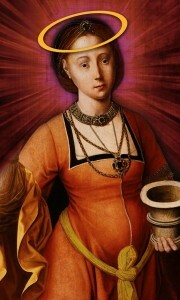 2012 Golden Halo winner Mary Magdalene prepares to welcome her successor. Well, friends, we began this Lent Madness journey over five weeks ago on “Ash Thursday.” We started with 32 saints and have now whittled the field down to two: Frances Perkins and Luke the Evangelist. While there’s been lots of talk about modern saints vs. “bedrock” saints and the “fairness” of it all, in the end the Faithful Four was very well balanced. We had a 20th-century lay woman, a 1st-century evangelist, a 20th-century martyred Salvadoran bishop, and a 7th-century abbess. Wow! Regardless of the ultimate outcome, we’ve met some truly remarkable holy people along the way. Perhaps you learned about folks you’d never heard of or maybe you renewed acquaintances with saints who have long offered inspiration. Of course the entire notion of placing saints in a bracket is absurd — each “contestant” has already earned a crown of righteousness in addition to a “golden halo.” But at the heart of Lent Madness is the abiding conviction that encountering those who have come before us in the faith enriches and enlivens our own walk with the risen Christ. Of course we literally couldn’t have done this without our stellar “Celebrity Bloggers” to whom we offer sincere gratitude. Laurie Brock, Megan Castellan, Penny Nash, Heidi Shott, David Sibley, Laura Toepfer, Neil Alan Willard, Chris Yaw. The unsung hero of this whole operation is former Celebrity Blogger and current Bracket Czar Adam Thomas. And we can’t forget the ever mysterious Maple Anglican who brought us the inimitable shenanigans of Archbishops Thomas and John (watch today’s video highlighting our final match-up here). You all rock! Finally, thanks to all of you who participated by voting, commenting, drinking coffee out of Lent Madness mugs, filling in brackets, talking about saints at coffee hour, and allowing us to play a small role in your Lenten journey. We’ve loved having each one of you along for the “madness” and on behalf of the Supreme Executive Committee we wish you a blessed Holy Week and a joyous Easter. Oh, wait, there’s one more thing before we set our face toward the Triduum. Cast your vote for either Frances Perkins or Luke the Evangelist — the 2013 Golden Halo hangs in the balance! The polls will be open for 24 hours and the winner will be announced at 8:00 am Eastern time on Maundy Thursday. 207 Comments to "For the Golden Halo: Frances Perkins vs. Luke the Evangelist"
How is it possible that voters would select Perkins over St. Luke. Where would we be without Luke? Where were we be without his gospel and the Acts of the Apostles? I agree completely!!! This truly is MADNESS!!!!!!!!!!!!!! It’s a mystery to me too why anyone would vote for Frances who strikes me as a socialist in her beliefs. Luke’s focus was on Christ, Frances’ focus in my opinion is on being “fair”. It has been nice learning about the Saints, a blessed Easter to all as we focus on Christ and His sacrifice for us. Thank you, Maple Anglican (and thanks to the archbishops) for your amazing contribution to Lent Madness. Every person who endeavors to follow Christ must interpret His message for the time in which that person lives. Go Frances Perkins! I have truly enjoyed Lent Madness as it has allowed some joy in Lent plus has allowed me to learn of the many saints of the church. Here we are at the end and until this year I did not even know that Frances Perkins was a saint! I didn’t know that Frances Perkins was a saint either. Actually, I still don’t. Thanks for sharing this link. It’s worth the read. @ Marj: That’s true. But without Luke and the other New Testament writers, how would Frances Perkins know what Christ’s message is? We are the hands and feet of Christ. Luke may have written the story, but Frances followed up. This has been a wonderful journey and I thank you for the opportunity to learn about some incredibly powerful and devoted people. I like the fact that you are acknowledging the modern day saintly along with the ancient and classic saints. It is difficult to think about now, but some 400-500 years from now these modern saints will still be in the haloed halls of the great and people will still be in awe of their holy works. Thanks for another awesome Madness! Secretary Perkins showed us how to be Christians in the twentieth century. It is up to us now. Can a member of OSLO vote any other way? I’m already eagerly looking forward to next year’s Lenten Madness. Thanks for putting so much fun in the Faith. With thanks to the Celebrity bloggers for wonderful writing, to Maple Anglican for bringing us The Archbishops (and the skinny on chocolate), and to the SEC for making it all happen, I’m casting my final vote for Luke who wrote, lived, and spread the Gospel. Hope, hope, hope we don’t have to wait until LM 2014 to hear from The Archbishops again! 2014 nominations commentary? LM withdrawal therapy? This my first year with Lent Madness and like so many others, I will look forward to Lent Madness 2014. Thank you for bringing a bit of fun during such a very serious and important time in our Christian year. I have learned a lot about a lot of well deserving people, but my vote will got once again to Frances Perkins. Although this is my first Lenten season to follow Lent Maddness, it won’t be my last.I look forward to learning much more about lots of amazing individuals who have followed the path our Christ laid out for us. My First Year too. I’ll be back! A blessed Triduum to the SEC, bloggers, commenters, and anonymous voters in the 2013 LM. It’s been a bizarre ride – local people whose history I grew up with, one whose family I knew, and let’s not forget the friends and comrades of the parents – those who were always held up as an example of what can be done by one. In the end, the results of LM matter not. The point is, as always, what have we learned? I had to vote for Frances Perkins. Seeing how you can live out a Christian life in the 20th Century is inspiring, especially for the 21st Century. Thank you to all, I’m not sure what I will do on Friday at 8am…. All of this year’s saints have inspired me and made me think about my faith and how to live it. I’m voting Frances all the way to the golden halo. My humble theory is that the closer we are in time to the person the more accurate the information. The great company of saints is so encrusted with mythology and legend that I wonder if we have any sense of the person. We do know the power of what “they” wrote or the stories of what “they” did. Also the pull as a MHC graduate makes the choice easier. *Well, I had Martin of Tours over Greg the Great, but everyone else was spot on. What is a tragedy? By Ancient Greek theatrical standards, a tragedy is a story whose ending is obvious, a plot which observers are powerless to alter. Luke is the obvious choice, a chicken-and-egg-argument saint who will take the Golden Halo and, tra-la, all shall go as expected. What is a comedy? By the same standards, a comedy is an upset, a wild veering plot with an utterly unexpected conclusion. Easter is a comedy, divine as they come. A comedy shakes us up, awakens us, opens us to new possibilities. It lights the mind and the spirit up and sends neural pulses firing in all directions as we discover wider patterns of connection. Joy feeds the soul. Laughter–in the service of wisdom and compassion–heals us all. I vote for Frances Perkins. Because Lent Madness should make us laugh. Lent madness–and Easter madness–should dazzle us with surprises and jostle our frozen-chosen minds out of their self-righteous winter ruts. I vote for Frances Perkins because, unlike Luke, she gets so little glory, and because she white-knuckled it for years for the sake of all the forgotten voices in the shivering, anxious crowds. 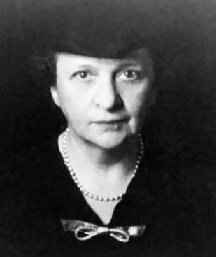 I vote for Frances Perkins because–despite her association with that expedient, motherly tricorn hat–I think she’d look fantastic on a mug, wearing a halo. Wow! Your first two paragraphs are the best Easter sermon I have ever “heard.” Very well put. And brief. Thanks for sharing these thoughts. Very well said, all around! How to decide . . . I cast my vote for Luke — think of the divine upset [comedy!] of the Christmas story Luke passes to us. God comes to earth as a powerless human baby, laid in a feeding trough! Angels announce the crazy, glorious news to the lowliest, least educated of society– some shepherds. I am so thankful for Luke’s account, which no one else recorded. If Frances wins I will rejoice as well. Thanks to all for the joyous lenten madness! Apologies for that electronic trip. My comment was that I hope you are in a pulpit. Speak with that much energy and your own golden halo shines out. thank you for these words to inspire my Easter sermon as well. Holy Week as the tragedy and Easter as the great divine comedy! Thanks be to God the inevitable will never be inevitble again! Following Luke this year and his close relationship with the prophets makes me not be able to vote for anyone but him. My apologies to Frances who is truly a saint and a new hero in my life! Well said, Mainecelt! I agree. Luke has been honored for centuries and will continue to be (deservedly). The work Frances Perkins did is still under fire today–she needs the Golden Halo more! The way she was able to accomplish God’s work within the framework of our flawed human system of government was miraculous! Ditto all your comments, Mainecelt..hope you are in a teaching/pulpit position somewhere. Spot on, Maincelt! I agree that you’re a powerful preacher of the point/joy/mystery of Easter–how can we get copies of all the sermons that reference your words???!!! So, also because she’s the underdog, I’m voting for Frances, even though Luke is my favorite gospeller (for so many reasons) and I love Acts as a “novel” with a cliffhanger ending. Thanks, SEC and CB’s (especially my friends Neil, Megan, and Penny), for another great Lent! How can anyone refer to FP as the underdog when she clearly has the vote of so many Dept of Labor and state of Maine folks on her side? Anyone who looks at the count on days FP was in the running can seethe impact of visitor votes. FP’s halo will definitely be a direct result of her faction’s promotion and in no way will tarnish the shine on Luke’s well worn one. Certainly FP’s win will bring national attention to LM. Thanks for all your combined efforts in bringing us Lenten Madness everyone. I am still having trouble reconciling the loss of so many of my personal saints, Martin Luther King, Oscar Romero, Jonathan Daniels, Absalom Jones, Harriet Tubman…but thank you all for bringing up their lives and actions for our consideration. Echoing thanks for a great comment! Love your reflection, Mainecelt!! It’s all Madness and Mystery! The Archbishops make a telling point about numbers (not to mention chocolate in the afterlife). But I’m still voting and hoping for the halo to go to Luke. Any one of the Faithful Four would wear it well, but Luke touched and touches the most lives in the most places. He touches my spirit. Lent Madness once again expanded my world, challenged my beliefs, and deepened my faith. I will try to let go of worries about the final vote. If visitors skew the numbers, well, it’s nice that they at least came in and found out what a cool church this can be, and what truly beautiful people abide here. Thanks, commenters and chicken-raisers. Thanks, Celebrity Bloggers. Thanks, Maple Anglican. Thanks, SEC. Bless you each and all. Luke. It’s his year. And, his year. And he is a real Saint, as well. To me Luke already has a golden halo, so I must stay the course with Frances. “… encountering those who have come before us in the faith enriches and enlivens our own walk with the risen Christ.” For me, that is Luke, and so I vote for him, although I have the greatest admiration for Frances Perkins. Thank you, SEC, for Lent Madness! And thanks to all who brought it about. It’s wonderful! Keep up the Good Work–who knows, some day in the far distant future you may look down from heaven and see yourselves in a bracket! Thanks for Lent Madness, it was great. Fun and educational. Looking forward alaready to next year’s Lent Madness! Oops. Yes, I can spell already. More coffee! Another year of blessed madness during Lent Madness. Well done, great writing, and quite a bit of sociological data to be found in the comments each and every day. Team Luke! Down with big lobster! Thanks SEC, thanks Maple Anglican, thanks CBs, and thanks Archbishops for the best commentary around. It’s been a fun ride! LMW will be a problem I fear. Thanks for another glorious, thought provoking, laughter filled Lent. It has truly flown by. The Frances Perkins juggernaut has been nothing short of astounding, and her impact on American society profound. However, where would Christianity be without Luke’s gospel? No Magnificat, no baby in the manger, no Prodigal Son, no Good Samaritan, no ‘Today you will be with me in paradise,’ no Road to Emmaus, no ‘Good News for all the people.’ Given all that, I had to cast my final vote for Luke. I tried to introduce Lent Madness at my parish last year. Alas, worthless priest that I am…I failed miserably. I tried again this year, and while I am still a worthless priest…this year…I cast all worry to the wind and preached, talked, and breathed LENT MADNESS all through Lent. There are poster sized brackets in the parish hall, and paper sized around the offices. St. Mary’s did Lent Madness. Next year…in Jerusalem! Thanks to all of you for this fine madness. It has been a great ride. Aww, don’t be so hard on yourself. God doesn’t make worthless people! Dear Aleathia! I shall so miss your Southern drawl ! For a whole year ! Ah, well, more LMW. All of us ARE Acts 29! I was going to vote for Luke. Then I read the wonderful sermon about Easter as a comedy and I had to vote for Francis. Thank you to all who contributed to my Lenten devotion of Lent Madness! The Holy Fool is picking DUKE to win it all. I’m sorry wrong Madness……LUKE to win it all. I’m all in for Luke. Blessed three days, all, and a joyous Easter season. If Frances wins, some will gnash their teeth at the “political correctness.” If Luke wins, some will likely bristle at the patriarchal or mythical aspects of his victory. I’ll be happy either way. Both remind us of our own call to be saints in our context. Some may never know our doubts and darkness, seeing only our public “mythic” face. Some may disagree with our attempts to love or even aspects of our faith and theology. Yet I firmly believe that we are saints nonetheless, and God will make our lives speak to his glory. Thanks to the SEC, the writers, and all those who took the risk to share comments – those serious or those that made me laugh. Lent Madness was a wonderful ride and true devotional for me. “I thank my God every time I remember you” (Phil. 1:3). See you next year! Thank you, Lou, for your gracious and thoughtful words. They express my thinking too. I voted for Luke. I KNOW, right? Luther indeed! Such a scrapper, yet out in only one round?! Man….Talk about “putting the ‘mad’ in Madness”! Ironically I think it was partly Luther’s anger issues that sunk him here, when his life was really dedicated to opening up the insight of God’s grace and freeing people from ‘angry God’ theology. Ah well. It’s Madness. Lots else to celebrate, so I shall neither gnash nor bristle at the ultimate result. I do love the glorious variety in the Final Four. Thanks to bloggers and fellow posters if anyone asks “Why ____?” of the result I am well-equipped to answer based on the aspects of saintliness they each particularly embody. In all too many elections, I have been reduced to voting for the lesser of two evils. And it is reducing. We are less when we do that. What I love about Lent Madness is that we get to vote for the perceived greater of two goods. We are enlarged in the process. Thank you, LM folks and all of you in the outfield bleachers/comment section. I am for Luke all the way!!! With out him we would not know the Lord as well as we do. God Bless Scott, Tim, the Archbishops, the Celebrity Bloggers, and last but not least Maple Anglican for Lentmadness! Thanks for giving me a new twist on Lent. I really enjoyed learning about the 32 saints competing for the Golden Halo. Vote Luke! For all the reasons I wrote about before, I vote for Luke. Thanks to our beloved Prior of the OSL Cyber-Chapter for introducing me to Lenten Madness. I have enjoyed it so much, learned so much, and value all of you and your comments so much! Please include this United Methodist elder in your Madness next year, and any other humorous and/or educational endeavors you may conceive in the meantime. I shall be so lost on Friday … I now know about Spy Wednesday and so many wonderful people I did not know about before, including Frances, who has my vote for living “the cruciform life,” and helping our nation recognize its compassionate potential, its ability to share its abundance. Thank you to all who put their time and effort into Lent Madness 2013. I’m hooked and can’t wait for next Lent — imagine that? Is Advent Madness a possibility? Please send on the other comments. Come to think of it, all the “official” saints are depicted with a gold nimbus in religious art. I love Luke’s Gospel, but my vote goes to Frances. Have loved participating in Lent Madness and all that I have learned. Now, looking for ways to introduce this to my parish next year. All suggestions welcomed! I voted for Luke as he introduced me –and continues to teach me about the Loving, Compassionate Christ. Blessed Triduum and Easter, Friends. Can’t wait for next year. As SEC stated above, but I’ll use my words – how blessed are we that we can be light-hearted and take ourselves not too, but our faith quite seriously. Cheering Luke on! My vote for The Golden Halo is St. Luke. What a wonderful season this has been! This is my first year with Lent Madness, and I’m hooked. It’s incredible how much I’ve learned and grown in my Lenten journey through this funny, clever experience. Haven’t heard “Spy Wednesday” since my childhood. Love it! I feel I know the SEC, bloggers and commenters and of course, Archbishops Thomas and John, and anticipate Lent Madness 2014. Thank you for the fun, and a Blessed Triduum to all! Thanks to both of you for LM. May your year be blessed. Look forward to next year. Correction! Janani was eliminated during the Saintly Sixteen. Oh, and I voted for Frances who I am sure was a real person. And an inspiration. The Frances Perkins quote is made for today’s DOMA case before the Supreme Court — “administration in a democracy is not easy”. While I am a Luke devotee, I give my vote to her. Unlike in the DOMA case, I will rejoice when either side wins! After much gnashing of teeth (my dentist will not be pleased), I’m voting for Frances. The aggravating pair-ups in this competition have forced me to think hard about my attraction to biblical, celtic, and medieval saints — any saint, in fact, from some misty past. So my vote is as much as anything a hat’s off to Lent Madness for prodding me to see the 20th century (and even this 21st) as fertile soil for the saints of God. I might rather it had been Oscar Romero in this final matchup, but Frances would look so cute in that little halo. Can’t believe it’s almost over! This was a wonderful Lenten activity. Thanks to all who made it so. Voting for Frances today. Luke’s already got his halo and we need all the modern day examples we can get to remind us – “the saints of God are just folk like me, and I mean to be one too.” Blessed Triduum and joyous Easter to all! I am so grateful for this Lenten observation. I had expected it to be fun and informative. I am delighted to have experienced as well a sense of community developed among the SEC, the CB’s, the commenters, Maple Anglican and the archbishops. May all here be blessed in the Triduum and may all have a joy-filled Easter. During the march toward the final four, I had voted for each of the four saints who made it to this week. Today I consider that I meet with a Bible study that has been reading and reflecting upon the Acts of the Apostles. From that experience, I perceive Luke as one who would have been an unlikely follower of Jesus of Nazareth. But for the Spirit of Christ’s gracious power to prompt Saul’s conversion . . . But for Paul’s response to divine call to proclaim Good News among the gentiles, the Greeks, and the Romans . . . But for Luke, apparently through mentor Paul, apparently meeting first degree witnesses and perceiving their stories about Jesus through a different lens . . . But for a physician’s appreciation for the power of healing . . . And so, for all of us unlikely followers and pilgrims, who are immensely influenced by Luke’s witness to Jesus the Christ, I vote for Luke. I will, nonetheless, be elated should Frances win the coveted Golden Halo, for her story provides us an opportunity to witness to the power of Christ embodied in a lay person of deep devotion to Jesus’s commandment to love our neighbors, identified in Luke’s account as the marginalized “other” whom Pharisee and Levite would not touch. No one can enhance Luke’s position, certainly not us and our Madness, so my vote goes to Frances Perkins because she became more than women were expected to be… bravely and with a heart attuned to God’s call…and played the game of power and influence successfully. Thank you for a delightful journey through Lent. I think Luke would vote for Frances, because she took what she learned, in great part from him, and put it into practice. And that, I’m confident, would make Luke smile. So my vote goes for the woman who worked against all odds to change the world, to make it a better place, based on what her faith told her, much of which she learned from blessed Luke. Go Frances!!!! Thank you TEC and celebrity bloggers, madness has been a larger part of my lenten devotions for many years now, and it’s new and exciting every year. I raise my mug in salute to you all! Thank you, thank you, thank you. Just cast my vote -All good things must come to an end –this has been an awesome Lent madness –thank you! Lent Madness had become a part of my Lenten rule. You have helped me realized that Lent does not have to be solitary. Yet, this community has called me to moments of solitude and reflection. A pastor from my 20s, the Rev. Dr. Kenny Smith, always remarked that we could “disagree without being disagreeable.” That is a characteristic of this community that I do not take for granted. As Carol Burnett sang, “seems we just get started and before you know it . . . Comes the time we have to say “so long.” I await the call of the Supreme Executive Committee to convoke in 2014. Until then, Godspeed. A big THANK YOU to the SEC, CBs and all the commenters and post-ers for this wonderful Lent Madness! It has been an adventure and has enriched my thought processes and my faith journey. Today I vote for Frances Perkins for the Golden Halo. I can have Luke any time I open a Bible and his halo sparkles. I am glad to know that there have been and still are people of faith working in the halls of government. May Frances wear the Golden Halo! Joining in the thanks to all the good folks at LM. You gave us a lot to think about and gave me (a first-time LM follower) a new perspective on what a saint is–even though I’ve sung “I sing a song” all my life. Another difficult choice. Last year’s Golden Halo went to a Biblical female, so I can’t simply go against both categories. Voting for Frances, because like Oscar Romero, she lived what Luke taught. And because I learned about someone I had never known. Never before, in 5 decades of Lenten observations, have the concepts of “fun” “enjoyment” or “eager anticipation for next year” ever infused the season. Thank you — all of you, in your various roles — for making this a truly memorable Lent. See you next March! Thank you! Thank you for the conversations, the knowledge, the thoughts, and the prayerful insights. I cast my final vote for St. Luke, and, with that, I wish each and every one of y’all a blessed Holy Week and a joyful Easter season! Set out to vote for Luke…after all , I have a cradle Episcopalian’ s allegiance to St. Luke’s Kalamazoo for my formative years. However, next year’s Frances mugs will generate so much conversation in its unexpectedness. Maybe some current bureaucrats will bump into it and pattern their civil service after Secretary Perkins’ example. To expand…should Frances win the golden halo, a plan to use the event as a teachable moment: Each of the 5000 FB friends of LM buys 10 mugs. The Forward Movement publishes a lovely collection of the CB’ s Frances essays. These 50,000 gift packages are sent to bureaucrats in DC and across the land. Should grant funding be available, purple WWFD bracelets can be made, to replace all those tarnished “livestrong” bracelets. “And the world is a different place”. mkahn–simply brilliant suggestions. Could you please run for political office? Go Perkins. A great person, a great MHC alum, and a great American. The gospel-writers we have always with us, but Frances Perkins breaks new ground for many of us Episcopalians. In the cosmic scheme of things, Luke is undoubtedly more important, but the delight and surprise of learning a new saint who goes where few women have gone before is important too. There’s no way I’d vote AGAINST any of the people we’ve learned about this Lent. But everybody expects Christians to honor gospel-writers. Who expects a bureaucrat? I’m for surprising our neighbors with a delightful choice. It’s really hard not to vote for one of the four evangelists, especially this one. But today is the 4th Wednesday of the month, which means my Social Security “check” slid into my account via auto-pay around 5 a.m. this morning. Without this—and despite a M.A., good health, a solid work history, and careful planning—I’d be out on the street, at least in a few years. So I must vote for Frances Perkins. On behalf of the 17,000 U.S. Department of Labor employees, thank you SEC and everyone who has voted! This has been a terrific opportunity for so many people to learn about our much beloved Secretary. And in our centennial year, no less! BTW: she’s catching up! DOL employees on the east coast obviously (and smartly) waited until lunch break to vote! It has indeed been a terrific learning opportunity, for which I am grateful. As a Canadian, Frances Perkins was unknown to me before this contest but problems she worked to address exist worldwide and are ongoing. I voted Luke, but I would not begrudge FP the win. She is a great example of Christian faith in action. It’s hard to believe that a politician, even a very good one, is beating an evangelist. Why? She beat the martyrs and St. Hilda, Social Security checks are delivered today, AND there are 17000 DoL employees — something would be seriously wrong if she didn’t win today! Voted for Luke, but promised my sister (a government employee) that I’d buy her a Frances Perkins Golden Halo coffee mug. You are so funny Sr. Winifred! I was looking for your comment. I knew there had to be one. Yup, we love this LM even though we may not always agree with the outcomes. I definitely felt like one of those people who always pick the losing side this year. Just glad there are so many great souls to choose among. Ha! And I had looked for you, Conny! Have a most blessed Easter!! Frances was not a politician. She was an evangelist in thought, word and deed – through her whole being. Thank you to all who contributed to LM – we love you all. Like the Pope’s not a Catholic! Whatever, she’s going to win, so maybe this will be known as the year of the oxymoron — a saintly politician wins the Golden Halo. . . it could be worse. And not all catholics are Catholic! Have a blessed Easter everyone – no matter what part of the catholic (universal) church you call your spiritual home! I’m well aware of that . . . it’s just an expression. Lent Madness has inspired me with details about old friends from seminary courses and new heros and heroines whom I had never met! Truly we are surrounded by a great cloud of witnesses!! As a newer member of OSL I must vote for Luke but Frances is a worthy competitor! It is neck to neck. Does the SEC have a carefully thought out plan about what to do in the event of a tie? Will they have to share one crown or will they each get their own Golden Halo? Is there an emergency tie-breaker voter waiting in the wings? I would love to have a Frances Golden Halo mug on my desk at work! (Her “performance” in this competition has already sparked many conversations in my largely unchurched workaday world.) I do love Luke, but he’s got many stained glass windows out there already. Thank you, Tim and Scott, for a really fun Lent that let me draw in my family and friends. Thank you, CBs, and especially Heidi Schott for your championing of Frances. Thank you, commenters, for your enlivening, sometimes aggravating, and enlightening posts. Blessed Triduum to all. Lent Madness 2013 has been a hoot! Loved every minute of it, even the heart-wrenching choices we had to make. Thanks, all….well done! Looking forward to the Madness in 2014. Thank you for a great Lent observation! I am going to miss you all, and thanks to everyone who has lifted up the season of Lent to new and astonishing heights. Can’t you guys come up with something mid-season, like who is your favorite Day of the Dead? You know ALL SAINTS day? What a difficult choice! I just reread the Gospel of Luke and Acts of the Apostles. The 1st century was a dangerous yet inspirational time for Christ’s followers. Where would we be today if they had not persevered? Francis Perkins too did amazing work and was dedicated to making the world a more just and fair place. Where would we be today if she hadn’t worked so hard to make the New Deal a reality? I had a dream last night and the only really clear part was hearing the word “lobster” and with that I cast my vote for the lady from the land of lobsters. What a blessing it has been to learn about LM this year via my beloved college MHC and to vote for one of my all-time favorite heroes FP. Yes, I joined in the fun because of the MHC-FP connection, but as a retired UMC pastor found this ‘mad’ exercise as inspirational and educational as many other Lenten disciplines and definitely the one that has produced the most laughs (not a bad thing in this day and time!). I am ‘converted’ regardless of who wins the Golden Halo and look forward to next year with eagerness. Thanks to all who worked so hard to do such wide-ranging research (loved the kitsch, too!) . . . I am going to evangelize for LM among my UMC friends for next year. Shalom! I knew nothing of Frances Perkins till this year’s Lent Madness. I’m SO impressed by her that now I’m reading her biography of FDR. Lent Madness is about learning new things which is why I’m for Frances (and because both of parents were helped by Social Security which she helped to start). Okay – this is getting ridiculous and WAY too political. You all have had your fun with Frances Perkins (who I agree was terrific). But now quit it and vote for Luke – whithout whom Frances could not have happened. OK, if a New Deal bureaucrat wins over a genuine foundational proclaimer of the faith, then this is a scam. Get with it people! Not a scam. Just democracy! Mainecelt, you said it. I love Luke. But like so many others, I did not know about Frances before this year’s wonderful Lent Madness. And she so profoundly deserves to be known! Frances has my vote. Thank you, SEC and bloggers and commentators and everyone, I give thanks for your enrichment of my life. What a wonderful Lent Madness this has been. I’ve voted for Francis Perkins in most of the rounds but am throwing my lot in with Luke for the final. But really, either way is okay because the whole point of this exercise has been to have some fun and learn about those forebears whose lives of faith inspire us. I doubt eith Francis or Luke care if they “win.” We are all winners for getting to know them better. Luke already has a halo, I’m certain of that. So, my vote goes to Frances. I have to vote for Luke. That gospel is my fav. – a gospel of prayer, women, the poor and the Holy Spirit. It is not even close for me. The Christology is foundational for liberation theology (or any movement that seeks to lift up the poor and marginalized). I cannot imagine the canon without it. It would seem to me that Frances Perkins was acting on the words found in the Gospel According to Luke. I have voted for her in past rounds, but not this time. While I believe strongly that we must lift up the voices of women who have, through the centuries, not been acknowledged, this particular match-up is no contest for me. As before, it has been a fun ride through this Lent Madness. And, while I will find it disconcerting if Luke is defeated, I will still look forward to next year’s brackets. Thank you SEC! And besides…we’re in Year C! Where did Perkins get her sense of appropriate mission if not for the astounding history, instructions, events as St. Luke was inspired by the Holy Spirit to write in what is now called “Acts of the Apostles”? Oops–maybe many of your voters have not ever prayerfully studied the Book of Acts! If it weren’t for Luke, Frances’ ministry might never have been honored as such…Frances’ ministry is the fulfillment of the kind of equality Luke envisioned…oh what to do?!?! Luke is the one for me. Without his records, we would have few of the intimate details of Jesus’ life. A hard decision rendered indoor poolside: Hope and Skye yelled “Go Frances” and then jumped in! Thanks for all the great Lent Madness fun!!! An interesting choice, between a woman of valor who actually worked for the Lord’s will in her life over a long period of time, and an anonymous writer of Luke-Acts. Some will feel miffed, as do those who jumped ship over their inability to comprehend humor, unless we truly do “get it,” that all of these candidates from the git-go are already wearing their Golden Halos. Their position of honor is far beyond our poor power to add or detract. Thank you for giving faces and stories to the “cloud of witnesses”-those in Heaven and the bloggers celebrity and otherwise who post here. It has been funny and thought provoking and when I ready my Day by Day there is a face and voice to associate with it. Thank you all and a blessed Tridium. I’ve certainly enjoyed this Madness (more than March Madness in which my team has already been vanquished.) I’m voting today for Luke’s “great joy for all people” over Perkins’ blend of church and state. Along with several friends, I have enjoyed the company of Holy Women and Holy Men as never before. Thank you. As Maple Anglican has made clear, the Golden Halo is of no real moment; the aim is Lenten fun. Thank you. The Triduum will seem more holy, and Easter more joyful than ever this year. Thank you. You are a Blessing; may we whom you have touched be as much. I have no consistent policy by which I cast my vote. Well, I confess to a preference for story over abstraction, so theologians don’t usually get my vote. Luke is always my saint. Luke’s narrative hermeneutic in Acts 10 taught me HOW to read the Bible. That said, this is Lent MADness after all. That a bureaucrat could live out her Magnificat faith for the benefit of the poor, that because of her I could retire when sick, rather than work until I did myself in, that — so many things — these are holy madness at its best. I surprise myself today by casting my vote for Frances. This year has been informative in so many ways. Blessings to all through this Holy Week and into the joy of Easter Resurrection! As of this writing (2:40 Pacific Time) it appears as though the combined forces of Big Lobster, Mount Holyoke, and the Department of Labor have conspired to bring Frances to the fore. Those of us who voted for Luke should not loose hope. Maybe Big Pineapple can pull one out for the Gospel Writer. If you have already voted – call your friends and neighbors, call your friends’ neighbors, call your neighbors’ friends. Tell them to go to http://www.lentmadness.org and vote for Luke. They don’t even need to know why – they should respect you enough to to do as you ask – at least this one time. Perhaps bribery with cookies or the gift of a Lent Madness mug would persuade. LET’S DO IT! Or, maybe people just want to expand the tent of sanctity to people who used their daily life to do good in the name of Christ, and did so and lived to tell about it. A vote FOR Francis isn’t a vote AGAINST Luke, or the Gospel, or Evangelism, or anything else. I was so proud of correcting myself in spelling Frances’ name, now I see that the corretion is wrong and the original “error” was correct. Perhaps a parable for our times? “Francis” with an “i” is a man’s name. “Frances” with an “e” is a woman’s name. I have decided for Luke but I am voting later – ‘voting strategically’ – in order to lull the Francescans into a false sense of security, and lure any undecided voters to the current underdog Luke. Mwha haha! My vote goes for LUKE for without his wonderful Gospel and Acts of the Apostles there would be an important chunk left out of our bibles. Just think what we would be missing out on. But my vote also goes with all those beautiful, hardworking and persevering saints old and new who have challenged us to live for Christ and the Gospel. That includes dear Francis too. OK peeps, if you are going to vote for Frances, at least spell her name correctly — that would be Frances with an E. Thanks! Oh no, I’m not too young! As much as I appreciate Frances Perkins, and all that she did for us today, I still had to go with Luke in this final vote. For as one person said, without Luke, how would we know Christ’s message? Thanks for another entertaining and informative round of Lent Madness! Can’t wait until next year! Thank you to the SEC, the CB’s, MA and the Archies. This has been a blast, and I have learned so much. In reading Frances’ biography, I am struck by the irony of what she could accomplish vs. what people of vision struggle to accomplish today. She has my vote (with great love to Luke, whose halo is surgically attached). “O blest communion, fellowship divine! When will the 2013 mugs be available? I am still mourning San Romero de América losing to Luke yesterday but at least I didn’t have to deal with the agonising choice between Romero and Perkins. i have enjoyed every second of LM…i have learned so much. i didn’t know of it until this year. now i will be ready for 2014 LM. i am already having LMW. thanks to all who taught me things i didn’t know. HAPPY EASTER! Frances Perkins was the correct response to a Jeopardy clue tonight. None of the contestants knew it. I was shouting it at the TV. Thanks Lent Madness! I would not have known it 6 weeks ago! It’s so sad to be casting the last vote in this year’s LM, isn’t it? But cheer up and stave off LMW by doing some Saintly research so you can propose some interesting contestants for next year. Thanks to the SEC and bloggers and all involved for the opportunity to have fun while learning. Thanks to all bloggers, SEC, Maple Anglican and commenters for this Lenten experience, no matter who captures they Halo. Dear SEC – Next year (there WILL be a next year) can we have “like” buttons on the comments? This has been another wonderful LENT, thanks to you and your Celebrity Bloggers! A blessed Easter and a restful Easter-tide to you all! Who could have predicted it?? Frances Perkins is almost certain to win the Golden Halo. And, to all those detractors who complain about Mt. Holyoke alumnae (of whom I am one) voting for her: how many women do you think have been touched by the lives of other saints while engaging in this contest? And isn’t that a good thing? 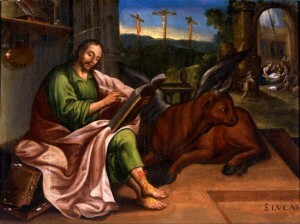 I vote for St Luke who trekked around after Paul and gave us a gospel and an early church history. He also wrote from a particular viewpoint which favoured the sick, the needy and women. His words may well have influenced Frances Perkins. Her work in USA was good . His work for the World was wonderful. As a British and Canadian subject who has lived in the Far East, I have seen the influence of the Gospel on Luke on new Christians. He has influenced me to work with the sick and to have compassion as Jesus did. He may well have written some of Paul’s dictated letters too. We don’t know enough about him but , just reading how he writes about Mary the mother of Jesus up to Mary Magdalene in the garden, reveals his concern for giving prominence to women. Luke was great and his words are still! I am NOT that girl…who can’t take a joke, or doesn’t know that this is tongue-in-cheek fun, or hasn’t enjoyed learning about the modern ‘saints’ as much as the traditional ones. And I don’t keep a hard and fast rule that martyrs must always win out over people who lived their faith boldly, but died of natural causes. And I even tolerate the still questionable kitcsh round. And I’ll admit that maybe it’s Holy Week crankiness talking, but I’m going to be REALLY disappointed if someone who worked in government wins over one of the four Evangelists! I may take it as a sign of the general decline of organized religion! I nominate Matthew for the LM 2014 saint roster (backed by IRS?) in order to heal the ‘government employee vs gospel evangelist’ rift that has manifested this year. He has a foot in both camps. My first year with Lenten Madness. What a blast!! I learned a lot, enjoyed the comments, and discovered some blogs that were really fun to read. I’m not a sports fan so my type of brackets contest was fun. Thank you all for the creativity, humor, insight and chance to learn. I even saw a coment from a cousin (by marriage); Bill and Diane Loring are you out there? Thanks–Who will win the Golden Halo???? OK, I’m ready to call the winner, but am more freaked out that I won’t have Lent Madness to rush home to after work!!!!!!!!! I saw the tiniest bit of info on the video Monday about 50 Days.org and I hope we get more info on that. I would also like to get going NOW on nominations for next year but have no idea as to how to get in touch secretly with the SEC. Thanks gals and guys for the great work and MANY laughs through Lent. I’m singing “I Sing a Song of the Saints of God” all through the tridiuum!!! Frances Perkins, author of a failing governmental bureaucracy, is beating Luke, author of the Gospel of Luke and the Acts of the Apostles??? Social security isn’t working? Huh? Maybe Luke is famous and well known enough. Until LM I didn’t know that Frances was even Christian. How powerful is it to know that the mind behind FDR social net, that is with us today, was a Christian woman? A social/political reformer, however dedicated, against the writer of Luke & Acts– the eloquent evangelist who (IMO) showcases most clearly God’s love of the poor and marginalized? Not a chance. Frances may have been all about fairness, but Luke’s Gospel message of justice is foundational. Thanks SEC and Celebrity Bloggers. Another great year. I really love you guys and the much-needed lift you give us every Lent. I was really torn this last vote. I got blown out of the water in the first round when Johnny Baptizer lost…but Frances Perkins captured my heart as the embodiment of my own struggle for a place among the Saints. Luke’s Gospel led me toward the light, but the example of Frances Perkins will lead me onward. Blessed be God for ever. Ah, the frustration with pure democracy: the tyranny of the majority. This reinforces my belief in the electoral college for presidential elections. My only consolation is that perhaps the “Big Maine,” Mt. Holyoke Alumni Assoc (not officially a Super PAC or Super Pax), and Big Labor/aka Teamsters and Labor bureaucrats 😉 will return next year for another battle for the Golden Halo. Even better, if all realize that they have their own personal halo and take it out to examine it, polish it up a bit, let God take the dents out, etc. Blessings on you all! I have found this year’s saints truly inspiring. I am already suffering from LMW. Please tell us how we can submit our own nominees or brackets for 2014! Amen. We are beggars when it comes to God’s grace, but it is through that overflowing, generous grace we come to believe and become saints – sinner-saints, yes, but saints nonetheless. Just think of how many Mt. Holyoke students or others considered what it means to be a saint perhaps for the first time. were seeds planted? I think God loves to use the “silly” and “lowly” such as Lent Madness and the many of us who play along and share their faith through comments or videos (such as maple Anglican). Thank you, SEC and celebrity bloggers, for a wild and entertaining way to reflect upon the many lives devoted to God in their effort to point to more love, and more light in the world. I have really had fun with this and it has sparked some conversation in the parish hall after service. I look forward to next year’s round of madness. Luke got my vote. I love his version of the Gospel for its women, and promotion of all people. Plus, the selected quote reminds me of that hilarious scene in the Vicar of Dibley when Dawn French is playing the angel and her not-so-bright shepherds keep prompting her during the “dramatic pause”! Thank you again for much levity during Lent. Many thanks for all those who provided such excellent writing, thoughtful and fun, for this massive Lent Madness production. There have been so many wonderful comments posted too. As others have said, I wish there was a “like” button for them, because so many have stated my thoughts so well. My final vote went to Luke with thanks for his wonderful insights about Mary. I’m sitting here, my Lent Madness 2012 mug in hand for the last time this year, reading the results about an hour before voting ends and not quite believing that Frances Perkins has come all the way and is about to win the Golden Halo for 2013. Talk about Cinderella….